Constructed in supple leather and finished with classic penny detailing, this driver is one of the lightest casual shoes to hit the market. Cushioned with Grand.OS technology for ultimate comfort, while an outsole with break and flex grooves provides increased flexibility. Leather lace detailing on the collar and vamp. My son loves his new shoes! Love the look and feel..
Great look, comfort, and versatile. bought these shoes for my son. This is his third or fourth pair of Cole Hahn‘s. They fit and are comfortable from the very first time that he wears them. This is the second pair I have bought in the last few months. The shoe is comfortable for long days of walking at work or out shopping with my wife. Every time I wear them someone compliments me on what a nice pair of shoes I am wearing. Cannot go wrong ordering this shoe! Great looking shoe that fits perfectly, too. I would recommend this shoe to anyone. It is stylish, looks great, and wears particularly well. Very comfortable with or without socks. I wear this shoe daily. its my second one from cole haan. amazing fit and great quality. however it does last not more than 6 months. not sure why. I am very pleased with the appearance and the fit. I have several Zero Grand shoes and love them all. This one is a disappointment and I would not buy again. Possibly it is because it is a slip on an not a lace up. All the other zero grand are fantastic but this one is not for me. Very comfortable. Light and great for the summer! I preferred the Grant Canoe Penny but couldn't find them anywhere after I ran my pair into the ground. This is a good runner-up though. these shoes are great very comfortable. starts out a little narrow but once broken in amazing feel. I order a 10.5 wide and it is very narrow. I don't have the widest foot out there, but always order wide for the increased room in the toe box. May want to order a half size up. Very narrow compared to other Grand shoes. Great looking shoe, I wish I could wear them. Even the wide width is narrow. I tried ordering a 1/2 size bigger, and still too tight. Cool shoes! Bought two pair, another in dark brown. I think they look better that just wearing boat shoes. Most comfortable pair of drivers I've ever owned! These zerogrand drivers are not only stylish and the usual quality you would expect from Cole Haan, but also extremely comfortable and wearable. The sole have the nike free run rubberized foam technology that give a great feel while walking, while the insole liner has a deep bed of comfortable, form-fitting foam. At first I was hesitant, because there were no reviews on these, but I am really glad I took the jump. Definitely worth the price. They look stylish and are very comfortable to walk in. I had the nike air drivers (lasted 5 years), but those are no longer available. These appear to be close to the same style and comfort. It's the style that my son's friends wear all the time. Classic style with an element of comfort. I have another pair of zerogrand shoes and like them. They look comfy and i love their drivers i have over 4 pairs of cole haan drivers. They came in my size and width, plus they are stylish. I have been looking at these shoes for a long time and with the end of summer approaching I wanted to give myself a present. I bought the blue pair and wear them all the time. This time I bought brown and even a back up pair! Look comfortable, stylish, and versatile. I have last years version of the same shoe, I love the shoe so comfy!!! They look good on his feet. And he looks cool with his cole Haan shoes on. love the british tan color, and smart casual, looking forward to wear for work and meeting with friends! 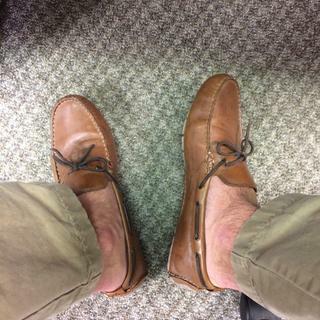 Decided to upgrade my boyfriend's run down Sperrys to his first pair of Cole Haan loafers. A great look and always wanted to try Cole Haan. I am an engineer and read about zerogrand which sounds like well engineered shoe. Hoping for it to meet my expectations. i bought a zerogrand last summer it was the best shoe that i bought. My son says these are the most comfortable shoes ever! Son loves current pair -- wore for years and not need replacing. I needed loafers. I like Cole Haan, it worked out. I have owned many Cole Haan loafers. They seem to fit the best while being the most comfortable. Been Buying this style from you for 20 years, so tradition? I was needing something that could be easily worn with shorts in the summer and pants in the winter! Looked good. Want to try. If I like, I may buy a second color. Extended size and good quality. I have another one and really love the way it feels. Hoping the leather feels as good as suede. Will the front tips scuff from walking (a common problem I have with drivers)? BEST ANSWER: Mine haven't as of this time. I wear 9.5M for other Cole Haan shoes, does this fit the same? BEST ANSWER: I got these for my husband who wears a 9 wide - he too has other shoes from cole haan-specifically the grand oxfords which fit perfectly. I bought these for a trip we took which did involve some walking- by the end of the day he had large blisters on his heels- perhaps it was our fault but probably the fact that they are drivers and don't tie played a part in the "heel issue" other than that he just kept saying "I think I need to break them in" maybe I should have gotten a size smaller? Great looking shoe though! My husband shoe size is 10.5 and it fits him fine. These are the best-made most comfortable Cole Haan drivers I have ever had and I've had dozens of styles from them. I purchased these drivers a week ago. Very comfortable. I wear them without socks, and my feet seem to stick to the bed of the shoe. They make a noise when I walk when my foot releases from the sole. Anyone else have this problem? BEST ANSWER: Hi Ken. I wear mine with complete no show socks and they do not make a sound that way. My favorite are the Nike ones, but they are made for women (I wear them anyways because they work!) they are called the Nike Women's Footie sock! Yep. I had the same issue. I got over it due to the comfort of the shoe. I also bought some no show (almost like slipper) socks that are very thin. I cannot even tell I am wearing them. Might be worth a shot. Haven't had the problem because I only wear them with socks. My pair are now getting scuff marks on the toe and other places. Which shoe polish to use? Mine are Chestnut Leather. I ended up taking mine back. What size would a women’s eight medium be in a men’s/boys ,You are always out of size 8 in women’s driver shoes so I thought I would try men’s sizes? BEST ANSWER: Depending upon the shape of your foot and generally speaking, a woman would wear a men's style in 2-2.5 sizes smaller. So, if you wear 9 in Women's, you would probably try a Men's size 7.5. Remember, though, that there are anatomical differences in the design of a men's style footbed as compared with Womens - the forefoot and heel are much wider. is there a way i can get notified when the size and width i want comes back into stock? BEST ANSWER: We don't sent personal notifications, but we do update the website frequently. The Online Customer Service Team (800-695-8945) will be happy to look into your particular size and width availability. are the insuls of the shoe leather? BEST ANSWER: The insole is leather with EVA molded edging. BEST ANSWER: The insole in the ZeroGrand Driver is permanently attached to the footbed. Our footwear is not designed to accommodate orthotics.